Nikki Parkinson is a great example of an ENFJ. She confesses her drive for recognition goes back 40 years when she was winning handwriting competitions at the school fair! Nowadays Nikki is one of Australia’s best-known and most successful bloggers and has won several blogging awards over the years. She is also widely admired in the Australian blogging community for both an amazing work ethic and the positive leadership she shows within that community. Currently finishing her first book which will be published by Hachette next year – it’s safe to say that if standing out as exceptional makes Nikki happy, then she’s in a very sweet spot right now! My brother Rory is a graphic designing ENFJ and the passion he has for soccer is his sweet spot. He’s been playing the sport for 30 odd years and even though we tease him relentlessly about being too old for it all at 35, if he gave it up, he would have to find something else that gives him both the recognition he craves, as well as the ability to lead people and motivate them. Highly motivated to gain recognition for their creative pursuits, Carly says LOTS of celebrities, especially rock stars and comedians are ENFPs – Bono, Steven Tyler, Robin Williams, Billy Chrystal, Lily Tomlin, and Ellen Degeneres to name a few. The common theme is that ENFPs thrive in the spotlight, are great at connecting with their audience, have fantastic timing, and usually just plain love being ”the talent”. They are also often very funny, creative people who enjoy collaborating as well so if they are not the star of a musical, or a corporate trainer, or a performer in some way, they are often enjoying a role that involves brainstorming outside-the-box ideas. What ENFPs should avoid at all costs, is spending too much of their day dealing with details, logistics and plans. These activities can temporarily kill their creative spirit and leave them feeling very unsatisfied in their day-to-day. Rachel McDonald is example of how you can be a rock star, in a non-rock star way. She is a highly creative soul who absolutely embodies that concept of inspiring others to be their best self – her coaching service helps ‘brilliant women create and live their best lives.’ When does she get to perform and be her best self? Via her speaking and what she writes on her blog of course. Elle Roberts is another creative soul walking a firm ENFP path. I’ve known Elle for a few years now and the energy she brings to everything she does is something to behold. She helps and energises other creatives in many ways, two being The Artful Business Conference and Bespoke Magazine. She gets to be her best self through the work she does with clients via her business Studio Exsto. So I guess it goes without saying that if you’re an ENFP who is not getting the chance to rock other people’s worlds in a meaningful way, then you’re going to need to find an outlet for that! Their mood is exceptionally linked to how productive they feel they’ve been that day. . . how many things they’ve checked off the list or how they’ve set others on the right path in a concrete way. Carly is an ESTJ and in a former life she was a Montessori pre-school teacher. What she loved about teaching at Montessori (where each child moves at their own pace) was that in each one-on-one lesson she gave she could move that child’s ‘performance’ forward in a noticeable, measureable, concrete way in a short amount of time. For instance: they didn’t know their long vowel sounds before, but 15 minutes later, they do! When it comes to her current work with the Type-Coach Verifier product, she loves the fact that based on their latest survey, it is more accurate than any other personality type assessment. 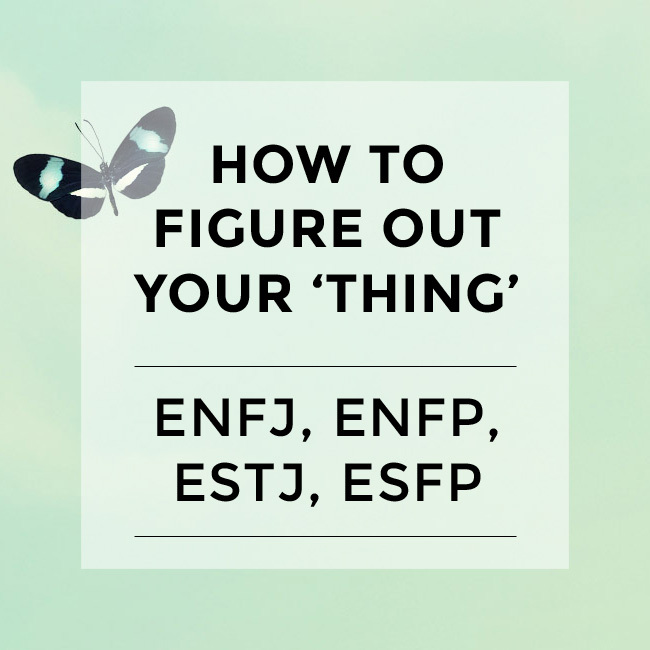 Carly has lots of ESTJ friends and an ESTJ father and says she’s never met an ESTJ who enjoys more than a couple hours of lazing around doing nothing. Apparently ESTJs say they want time to relax because they exhaust themselves trying to be productive, but when they have it, they get antsy immediately. So, if you are an ESTJ, you’ll find you are happiest and most motivated when in execution mode, and spending a large percentage of your time on a daily basis completing tasks that are productive in a concrete, objectively measurable way. Carly says tv chefs are a classic example of ESFPs – they can be talking, looking at three different cameras, creating rapport with another person on set … all while cooking up a storm. My friend Dave is another classic ESFP – friendly, chatty, high-energy; he is the ultimate people person. You cannot go anywhere with him without having to stop several times to stop and talk to someone he knows. He also owns a couple of West Coast Hi-Fi stores and all our friends have stories of going into Dave’s store to buy a $50 DVD player and coming out dazed, confused … and proud owners of a new $5000 home entertainment system. He is the most dangerous of salesman because Dave is such a genuinely friendly person, you never feel you are being sold to when he is talking to you! ESFPs thrive most when they have regular interaction with lots of people on a daily basis. And as parents, they like to be “ever present”. For example, it is much more difficult for ESFP parents (than other personality types) to head off to work and leave their kids to someone else all day. So, if you’re an ESFP, it is well worth thinking through how you can structure your life and career in such a way that you will a) be around people much of your day and b) if and when you have children, you’ll be able to spend lots of quality time with them on a daily basis.